Image caption An official statement said that Hafiz Ringim had been put on "terminal leave"
Nigeria's president has sacked the chief of police, Hafiz Ringim, forcing him to retire early, a statement from the presidency says. It follows a wave of attacks by the Islamist group Boko Haram, the latest in Kano on Friday in which 185 people died. The group says it wants to overthrow the government and impose Islamic law. President Goodluck Jonathan's move was aimed at "meeting emerging internal security challenges", AFP reports. There have been calls for the police chief's resignation since a man suspected of masterminding Christmas Day bomb attacks on churches escaped from police custody earlier this month. According to the AP news agency, a statement from the presidency said Mr Ringim had been placed on "terminal leave" pending his planned retirement in the coming months. Mohammed Abubakar has been appointed as his replacement "as a first step towards the comprehensive reorganisation and repositioning of the Nigeria police force to make it more effective and capable of meeting emerging internal security challenges", AFP news agency quotes the statement as saying. The statement said all six of Mr Ringim's deputies had also been approved for immediate retirement. The BBC's Mark Lobel in Lagos says the early retirement of Mr Ringim - just weeks before his official leaving date - illustrates the urgent pressure on the authorities to restore public faith in the force after the deadly attacks. 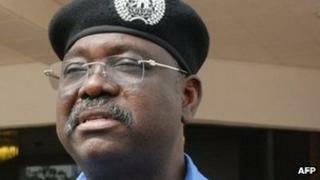 A full reorganisation of the Nigerian police force is now expected, our reporter says. The attack on Kano, which targeted police stations and other official buildings, was the deadliest attack Boko Haram had launched, although it has killed hundreds of people in recent years. Boko Haram, which loosely translates from the local Hausa language as "Western education is forbidden", first came to prominence in 2009 when hundreds of its followers were killed when they attacked police stations in the north-eastern city of Maiduguri. Last year, it carried out suicide bombings on high-profile targets such as the headquarters of the UN and the police in the capital, Abuja.